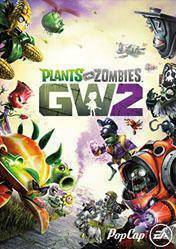 Digital code, or cd key, of Plants vs Zombies Garden Warfare 2, the second installment of Warfare Garden of Plants vs Zombie saga for the Origin platform, so you must have an account to activate the download. In Plants vs Zombies Garden Warfare 2 Dr. Zomboss has conquered Suburbia and transformed it into a paradise where plants do not exist and full of zombies. Now is the time to reconquer its territory. Throw yourself into an offensive in the new Assault mode for 24 players and claim your territory, or you can also choose 4 cooperative players mode, and even play solo. This new release of Plants vs. Zombies comes loaded with new features: 6 new classes join the cast, so a total of 14 playable characters, new skins, new multiplayer maps, 12 maps in total, and a lot of humor will be available. This time, we can choose either of the two sides of this war without quarter. On the one hand the plants, with the aim of recovering Suburbia, or stop the invasion and preserve botanical Zomburbia leading zombies. A title full of humor and fun in one of the most fun cooperative EA franchises. Brings back old memories,of me as a kid playing this game and being confused,because the plants were alive.Multiplayer aspect makes this game come to life! Amazing game! It expanded the first one by adding new content, new plants, new zombies, new maps, revisiting old maps but changed, and more changes and additions that help the game be still played! Brings the game plants vs zombies to life.